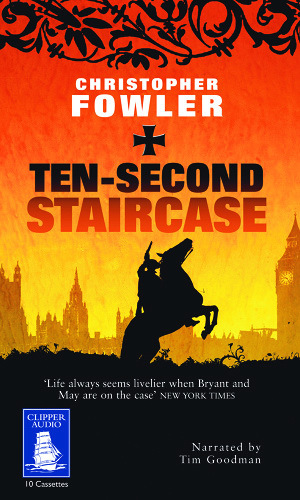 TEN-SECOND STAIRCASE is the fourth in Christopher Fowler's Bryant and May series and the events in it take place a few short weeks after those in the second book, THE WATER ROOM. The success of the pair in that case has both attracted extra funding for the Peculiar Crimes Unit but also the disapproval of the Home Office who are trying to shut the Unit down. Set up in wartime, the PCU is outside the regular Met police and answers straight to the Government and they receive all the odd cases. It's not long before the two elderly detectives are called to a murder scene. A controversial artist has been drowned in her own 'installation', a display case, in a gallery in the former County Hall building. The only witness, a young boy who was part of a school trip, claims to have seen a tricorn-wearing man on a horse scoop up the woman and drop her in the tank. The press soon gets wind of this and nicknames the killer, The Highwayman. A second death of another minor celebrity is equally puzzling. He is hit by lightening whilst alone in a private gym. Again there are sightings of a 'highwayman'. Bryant and May are drawn time and again to St Crispin's school, the school attended by the witness to the first murder but are stumbling in the dark as to the motive and identity of The Highwayman. When the Home Office threatens to shut the Unit down unless they solve some of their outstanding cases, the team splits, with May working on The Highwayman case and Bryant aiming to close the long running case of the (oft mentioned) Leicester Square Vampire. The latter investigation finally sheds some light on John May's personal circumstances that have been alluded to in earlier books. The plot of the TEN-SECOND STAIRCASE is slightly more straightforward than in previous titles and the identity of The Highwayman shouldn't come as too much of a shock. As usual, the combination of the witty writing and Tim Goodman's narration make this an absolute delight to listen to. I laughed out loud on numerous occasions. "Your chairs are horribly uncomfortable," complained Arthur Bryant. "I crossed my legs and fell off." The story is well paced and tense with some scary moments for one of the newer characters. The younger versions of May and Bryant in the shape of crime scene investigators, Kershaw and Banbury have an increased role this time around and the loyal and lovely Janice Longbright is still on hand. The other major character is London, the history of which, is the underlying theme to all these books.